Love letters. Does anyone write love letters anymore? 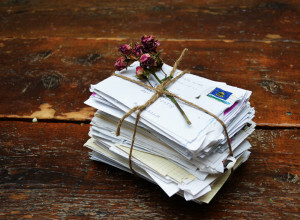 What makes a love letter? Of course, the song lyric is a very sad one because in this sad ballad the true love betrays her for another. But, the love letters still show the love she once had in the past. While unpacking I found some old letters. Not love letters, but letters of love, daily routines, the weather, and of missing one another. No one really writes letters anymore, how sad to lose such a valuable art. One of the letters I found was from my husband, on his first remote assignment in Turkey. How young we were and how his heart ached of missing me and our two young boys. O my, the things he missed and the yearnings he had in his heart to be home. There was no email, no Skype, no instant pictures to send nor videos for him to watch. There was just the long wait of watching the mailman deliver that weeks letter or two. There was a letter in the box from my grandmother. It was written just a few weeks before she was going to take her first plane ride to Texas visiting Vic and I. There was no mentioning of her worries about flying but only of how she could not wait to see me before her first great grandson was born. She wrote about my grandfather who would soon be retiring from work and how they hoped to spend lots of time on the mountain to get out of that hot humid heat Georgia is known for. She wrote how much daddy misses me and how quiet the house is without me. I can tell she changed the subject quickly to stop the thought of missing me. There were other letters and what I loved so much about them was the daily talk of everyday life. I could see daddy out cutting the grass and mamma sitting in front of her sewing machine making quilts. I loved the talk of the garden, of how the tomatoes were coming up great but the beans were not going to be the best this year. Of who had came over for dinner and what they had to eat. O how them letters would pull me back to a time where I felt loved, felt safe and warm and how my memory would pull out smells from my childhood. The one thing about letters is you are holding the past in your hands. You see their handwriting, you look at the post date on the envelope and you notice the price of the postage stamp. Writing a letter is a labor of love, and its a lost art. I think I need to write more love letters. I want my grandchildren to be unpacking boxes one day and come across a packet of old love letters that I had written to them. I want them to read and hold a part of the past and feel safe and warm. I know it has been awhile since I’ve last blogged. I’ve been busy moving into our new home, no more living in a camper. This has been an emotional move for me, but my husband continues to reminded me every move has been emotional move for me. 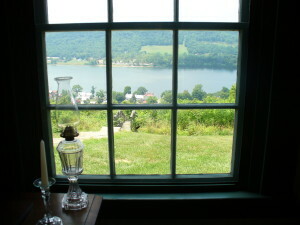 I’ve spent the first few months looking out the windows and it makes me reflect on how many windows I’ve looked through. My first windows, looked through as a child, were these huge ceiling to floor windows in our living room. The view was picturesque of the mountains I grew up with. How the mountains would change without ever moving. Colors of Fall would draw visitors from near and far. As winter came, the mountains would turn a cold blue and I would get excited when the tops of the mountains would get that white cap of snow. My next window was shortly after I got married. It was a small window and I would look out onto a small yard. A huge tree occupying those noisy black and white birds. San Antonio was huge to me and so different from what I was used too. My next window in Tucson Arizona was bigger and I had the company of our first born, Chris. It wasn’t a very exciting view, a parking lot to the apartment complex we lived in. But, we would both get excited when we saw the little white car pulling in and Chris new it meant his daddy was home. One window that stands out is the window looking out over the small village we lived at in Germany. How I loved looking at the green hillsides and watching the locals going to the small stores with with their baskets. At night I would look at the stars and think how far I was from those mountains that I love so much. My favorite window was my bedroom in Wendell, NC where every morning I would pull back the curtains and see my goats staring at me, waiting for their breakfast. Sometimes Hank would be sitting on top of his goat house and would jump down when he saw me looking out the window. The window I look through now has the view of a neighborhood. Homes close together with sidewalks, multiple cars parked in each driveway, and manicured yards in front of every home. I’am trying to get used to it but, at my age moving does not come easy. I know it will take some time but, I am not one to wait and just stare out of windows. Wont you please put a penny in the old man’s hat. If you haven’t got a penny a half a penny will do. If you haven’t got a half penny, God bless you. I love Christmas but especially my childhood memories of Christmas. Back then Christmas was Christmas. There was no fine line on what to say, what to do, or what to put up. It was Christmas period. Schools still did a Christmas program with a Nativity. Court house lawns had a Christmas tree and a large plastic Nativity with no one objecting to it. As a child I loved all the Christmas shows, Peanuts, Frosty the Snowman, and even the adult ones, Andy Williams, Perry Como, Bing Crosby and Bob Hope shows. I remember listening to Christmas music on the huge stereo in the living room. My mom, grandmother and I sit staring at it when Elvis Presley did his live Christmas program from Memphis and we all were taken with “I’ll Have a Blue Christmas”. In school teacher’s spent most of the day helping us make ornaments and gifts for our parents and grandparents. Every room had a tree and in our room one of the boys would volunteer to cut down a small ceder tree that we decorated with paper chains and strings of pop corn. But, the one thing that would let me know Christmas was here was the fruit basket. Daddy would always get a larg fruit basket from work. How I loved coming in the house and smelling the fresh aroma of oranges, apples and tangerines which would fill the air. There were bags of orange slices, spiced hard candies, chocolate drops, peppermint sticks. A bag of mix nuts that we would cracked while watching Rudolph the Red Nose Reindeer. There was always a coconut that mother would use to make her fresh coconut cake for our Christmas eve dinner. Year after year, O how I looked forward to that fruit basket. Sitting by the fire and examining every piece of fruit and every piece of candy; It lasted the entire Christmas break. I can remember a few Christmas toys of the past but even today, when I go into the grocery store during Christmas and go through the produce section, I smell the fresh fruit. It’s then I get a tear in my eye. How I miss my grandparents home, of growing up in a time of love with a warm fire, watching a black and white television and cracking walnuts. That was all you needed…….and of course the fruit basket. or I will lose my head. I’m frightend me o’ my. and I’ll be a pumpkin pie. 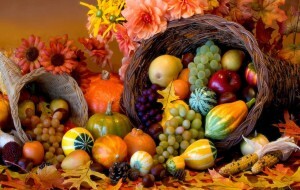 Thanksgiving, the start of holiday season with days out of school. I grew up in a time where I watched the Macy’s day parade on a black and white television. My grandmother, busy in the kitchen with every eye on the red glow of the stove. The yeast rolls out on the carport on top of the chest freezer, rising. The cakes and pies on the dining room table. Mom would put the turkey on at night and let it roast slowly in the oven. You woke up to the smell as it wandered it’s way down the hall and into the bedrooms. Daddy would be coming in from feeding and checking on the chickens. He would sit at the small kitchen table and try to find room to sit a cup of coffee down and have some breakfast. It was a different time. We didn’t have to wait for family to fly or drive in from another state. There wasn’t any missing family (except when my uncle was in Vietnam). I remember watching the “soaps” on TV. Their elegant settings for the Thanksgiving feast; the fancy china, and crystal. Everyone all dressed up sitting around waiting for the servants to prepare the meal and to let them know “when dinner is served”. Our Thanksgivings were nothing like that. Sometimes the men in our family had been deer hunting early that morning. Sometimes the weather had been really nice and we would place long tables in the built in carport and food would be spread out everywhere. Tammy and I would run outside and play in the woods, looking for the largest and most colorful leaves. Later the rest of the family would show up around 2 for dinner. We never realized then how thankful we were that we could all be together for such a special occasion. Looking back, we should have been thankful for all the little events and times we spent together. Being the one that moved away, Oh how I look back and think of the simple things I missed not being there. Just the simple dropping by or the phone call “I made too much soup come over and eat with us tonight”. The conversations of just about everything. Thanksgiving is a happy and sad holiday. We are happy and grateful for those we see around the table and wishing to see those who didn’t make it, hoping to see them the next year. Sad for those those we will no longer see here on this earth. Be thankful if you are just a hop, skip or jump near your family; don’t take it for granted. I know this is a little late, but with Veterans Day still being fresh I wanted to tell the story of my husband getting his first strip. Still being newly weds and with a baby on the way, money was tight. Vic had finished his basic training and was now in Law enforcement training, still at Lackland AFB in San Antonio, TX. We lived in a tiny cottage off-base where Vic would have to leave around 4:00 in the morning, trying his best not to wake me. When I awoke, I’d spend my days watching TV and working on a baby quilt for our first child. My days were long but Vic’s were even longer with his early morning rise and an evening accommodating a young wife with child. He was one of the few Airmen living off base with a wife and baby on the way. He would come home from his day, eat supper and get his uniform ready for the next day. He would press it so the crease would be just right, and then spite shine his boots, polishing them so they would glimmer. We’d then sit on the couch where he would rub my belly and watch a little TV before going to bed at 8:00. Well the day came when Vic received his first stripe. He would be a an Airman verses an Airman Basic. It did come with a slight pay increase, not much in those days. He came home that afternoon so excited, he would officially be an Airman the next day. We did our normal routine supper, belly rub and TV but during supper he showed me how to sew his stripe on his uniform. He took out a dollar bill, placed it on the shoulder of his uniform and the length of the dollar bill from the shoulder to where it stopped was where you sew the stripe, center across the crease. “Now you can do this, can’t you?” Vic asked me. “I think I am able to do it”, I replied. So, while he went to bed, I went to work on his uniform. Like the elves working late during the night at the clobber’s shop, I was busy working on Vic’s first stripe for his uniform. Vic got up before the sun did and dressed in the dark like normal, as not to awaken me. He rubbed his hands across the stripes, so proud he was. He gets to work and gets in formation for guard mount, still dark. All the airmen standing straight waiting for inspection but Vic was standing a little straighter and a little more prouder than the rest. Vic looked down at his stripes. They were in place just like he instructed but, his sweet wife had sewn them with pink embroidery thread and stitched them with french loops all the way around the stripes. My poor husband had to endure these pink stitched stripes all day. He came home, stood at the door and ripped those stripes off and said “why pink….WHY? Vic was a good husband and said nothing else to his nonmilitary young bride expecting his first child. That night Vic sewed his stripes back on with the green thread he bought at the clothing and sales at the base. For the next 22 years, I was never asked to sew another stripe on again. Yesterday we sold our home. We thought it was our last home, the one where we would grow old together. It was a great little house nestled in the woods. I have gathered great memories there. 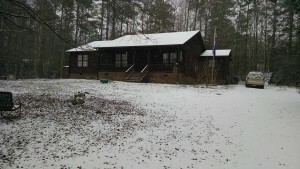 The house where our grandchildren came to visit. 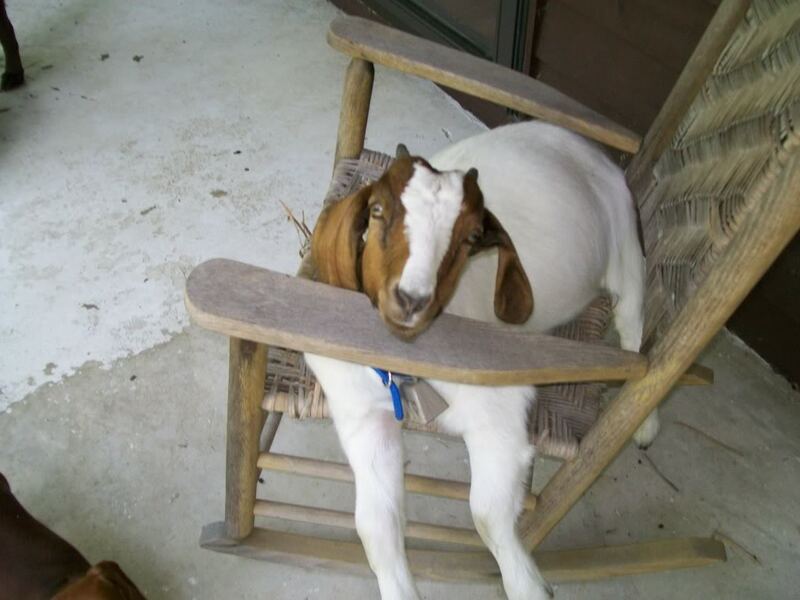 Everywhere I see faded visions of my life; my life with goats started and ended there, also my chickens and bunnies. The final resting place of my wonderful dog Sid and my darling Libby. But now we are once again packed up and starting again to find our forever home. It makes me think back to our very first move. Right out of high school, recently married , and Vic joining the Air Force. Funny everything we really owned fit in the back seat and trunk of our car as we headed out to San Antonio, Texas. Vic had gone through basic training and was now going through his tech school there. We were young and now expecting our first child. We found a cute little furnished cottage to settle into. To me it was more of a playhouse. We had very little and even less money. I spent my days embroidering on a baby quilt, and trying to figure out what to make for supper every night. We lived there for 8 months. Then, it was on to Tucson, AZ. We had most of our few things shipped on ahead to the base so once again we packed up the little car and pulled a tiny U-Haul carrying a small white cradle for our son Chris who now filled our back seat. We spent 3-4 days crossing Texas and New Mexico before we crossed the state line into Arizona. I do remember it being around 3 o’clock in the morning and I turned on the radio and the first song I heard was “We Got Spurs That Jingle Jangle Jingle”. I knew then we weren’t in Ga but in the west. It was hot, and rocky with very few trees. Even the mountains were just great big rocks to me. The girl from Georgia was dealing with culture shock. Finding a place to live was hard. We had to give up our room on base after so many days and finally found an apartment close-by. I remember sitting next to a little bush, I had placed the baby quilt under it and lay Chris on it so he would have some shade while we waited for our apartment to be ready. I remember Vic coming out of the Manager’s office with a pale look on his face. “They took it all”, he said. What do you mean they took it all? “They took all the money, first and last month rent and a security deposit. Now I was pale because I knew it was a week before Vic got paid again and we still needed diapers, formula and groceries. I panicked, I went to the nearest pay phone (this is 1981) and called my mom at work, think goodness she had a toll-free number. She told us she would wire us money to our checking account and it should be in the bank tomorrow. You know it was those early years and being so far from family where we really learned to depend on each other. It made us strong, yes I did call my mom for that emergency. But, that was what it was, an emergency, and that is when parents should help. I think one of the best gifts that parents can give their children is not give them everything they want but, be there when there is a need. We lived there for 14 months then, on to another move. I will write more on that next time. “Woooooo” went the wind and out went the lights. And 5 little pumpkins rolled out of sight. I have no idea who wrote this little poem. It has been around forever. I remember learning it back in kindergarten at the First Baptist Church in my home town when I was 5. I remember how excited we would all get when we got to the woooo part and clapped our hands “out went the lights” we would scream and giggle while trying to get out the last verse, then beg to to it again. I loved Halloween. The first holiday to start things off. Back when stores put out the seasonal items at the appropriate time. Going to the Dixie Dime, looking at the store costumes with the old plastic masks with the rubber band attached. Which would get tangled up in my hair and would have to be cut out at the end of the night. Mom would always have to make the eyes bigger and the nose holes larger so we could breathe. Most of the time my grandmother or my mom would make my costume. I once had a homemade bunny suit complete with standing ears. Once I was the great pumpkin (my mom really did a good job on that one.) Speaking of the Great Pumpkin, the cartoon specials back then when they were called cartoons, they were special, because you had to wait all year for them to come on. There were no DVDs or no YouTube to watch over and over. You had one chance and if you missed it, arrrgggg you would have to wait a whole year to see it again. I would sit as close as I could to the television in my little red rocking chair till my granddad would pull me back. “Your ruin your eyes sitting that close.”, he’d say. I don’t know why he was so concerned about my eyes when his big leather chair was just as close but, his chair never moved. My grandmother would make fudge while I rocked away. Then CBS would announce a “this is a special presentation” followed by that classic “Peanuts” music……..It was magic. Trick or treat was different too. I feel sad for today’s children and their assembly line way of trick or treat. Everything is pre-packaged. Mothers hanging over them, asking those passing out the treats if it’s sugar, gluten, and dairy free. 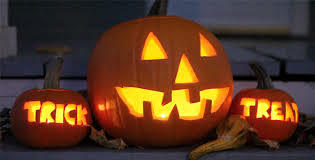 Nowadays there’s even a time to start, a time when you must finish, different color pumpkins meaning different things and “this is a scare free zone.” Really? It’s Halloween. One of my favorite Halloween nights was with my cousin Tammy and her cousins. I must have been in the 4th or 5th grade. I can’t remember what my costume was but I’ll never forget Greg Hogan dressed like a woman. We called him Gertrude the whole night. If I remember it was warm that night and Gertrude went mostly barefoot. His older sister, Debbie, and younger sister Melissa made up the rest of our group. No parents, just us and a night of adventure ahead of us. We walked all over the small town of Eton going from house to house. Walking down dark roads telling ghost stories and trying to scare each other. Knocking on doors yelling “Trick or Treat” and filling our bags (no plastic pumpkins for us) with no small “fun size” candy back then. You got full sizes and they were bigger. The best part of the night was going to some of the older ladies homes where they would hand out slices of fudge cake and you would sit on the porch, eat the cake and drink it all down with a glass of milk. They would ask “who do you belong to?” and we would tell them and they would say, “Oooo, I remember your parents coming here on Halloween night.” Then there were the homes with popcorn balls, caramel apples, homemade cookies, and fudge. By the end of the night we felt like Templeton the rat at the fair from the book “Charlotte’s Web”. We would finally call it a night as we watched some of the porch lights turn off for the night. You could still see the glowing eyes of pumpkins and the candle inside of them slowly melting down as we were dragging our treasure of candy back to the house. It was a great night and one memory I hope will stay with me forever. 26 Feet can get mighty small. 26 feet is the length of the camper we are currently living in. Most of my life has been spent moving, no we are not gypsies but close. For 22 years my husband served in the Air Force. When we married, right out of high school, I thought he would do the 4 years and I’d stay home, go to school, and we’d settle down in my hometown. That was not written in the stars for me. So now, 20 moves later, we are in a camper looking for our “last” home. 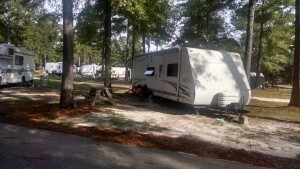 As we followed the “connect the dots” in our lives we have ended up here in Columbia, SC, temporarily in a campground. Like when we lived in Florida, we are not on vacation full time. Even the campground we are in isn’t a vacation resort. There is no swimming pool, no walking trails, or no group gatherings around a campfire at night roasting marshmallows and telling ghost stories. No this campground is a modern version of “Grapes of Wrath”. Workers are here for long term jobs, snow birds coming and going from north to south. I do see a few lifers, you can tell by the redwood decks they have added to their campers, little fences around them to keep their yapping dogs in and hanging baskets of ferns. The Campers come in all shapes and sizes. Some are really nice and large with their slide out rooms, their flip down grills on the outside and even flat screen TV’s so they can sit out in style. Other campers are small, and serve the purpose of a place to sleep when the day is over. Our temporary home is somewhere in the middle. Vic’s job has made us relocate here, so while he is at work I am “camper wife”. This is another reason why I started a blog, another way I can have a little conversation with others while we wait the finalization of sale of our North Carolina home. The little camper is quaint but serves us well thanks to some dear friends who loaned it to us and we are so grateful for that. We didn’t want to rent something and get stuck in a year lease and the thought of packing one more time made my stomach sour. I try to keep on a lose schedule to help pass the time. I get up, make our little bed up, take 8 steps to the bathroom, passing through the kitchen/ living area. I get dressed because by then my two wiener dogs are waiting at the door for their morning walk. Yes, you are required to have at least one yapping dog if you are camping. I grab the much needed poop bag because I’m a responsible dog owner and you never know who might be watching if you don’t. We get back, I make a little breakfast. Vic leaves very early for work and I usually sleep in; I have a hard time sleeping at night. I get on the computer and check in on FB, watch TV and keep my day busy with Find a Word and Words with Friends. I watch the daily goings of the campsite. I watch campers come in and I watch campers go out. I watch others walk their dogs and wonder what brings them here, thinking there are most certainly some stories here to add to my collection. I guess it’s time we get better acquainted. I grew up in a small town near the mountains at the base of the Appalachian trail. I lived in the same house with my grandparents for 18 wonderful years. I grew up during the 60’s and 70’s and to me these were the last years of growing up with values, respect and good work ethics. I graduated from high school and quickly married my high school boyfriend. Vic was already enlisted in the Air Force and what I thought would be a quick 4 years then back home, ended up being 22 years of adventure. During those 22 years our family grew with the help of two boys and now 4 grandchildren. The stories I want to share with you are chapters of my life and how they impacted me. Some are humorous, some will bring tears, but they are stories of life. They will not be in any order of a time line but told as if sitting with your grandmother as she spilled out stories when she thinks of them. I hope these stories will touch your heart and bring back fond memories of your own and will give you the desire to share them with your loved ones. Singing the sweet little songs they know. – Written by American Poet George Cooper. My mama would often recite this poem this time of year. She said she had memorized it while in grade school. Grade school was really the only schooling she ever had, she stopped after 6th grade to work in a spread mill in our small town. There she made bed spreads till the war broke out and to the factory and made parachutes. Mama and Papa were a well-oiled team. Daddy would cut out the squares while mama would place them and sew. He had cut out a pattern from a piece of plywood and must have gone through thousands of markers tracing the pattern to the different fabric. Years later when I was married and happened to be living in a trailer behind their house with my two young boys, I could see the light come on in the built in carport early in the morning. I could see papa through the window cutting out squares. There goal every year was to have 100 quilts to sell on the mountain. They enjoyed that time of their life sitting up there on the mountain. Papa loved to talk to the people, even if he couldn’t hear half of what they were saying. They often were asked to have pictures made of them standing in front of their quilts,. Sometimes they would use the phone in the rock shop to call me to bring more quilts. I would load up my car with quilts and bring them up there. Mama was proud of her work and had every right to be. People of their generation needed to feel worth. Hard workers didn’t mind hard work if it accomplished something worthwhile. I hope someday I will run into someone who happened to come along the mountain and bought a quilt from my grandparents. We still have the ones she gave us and I can put my hands across the fabric and can still feel the touch of those strong loving hands of hers.